A refrigerant is any substance that can be manipulated to boil and condense at the correct temperatures and pressures for the application. The service tech does not deal with the design of refrigerants but only works with the applications. We need to understand how they work and which ones are made for which applications. A short history of refrigerants. 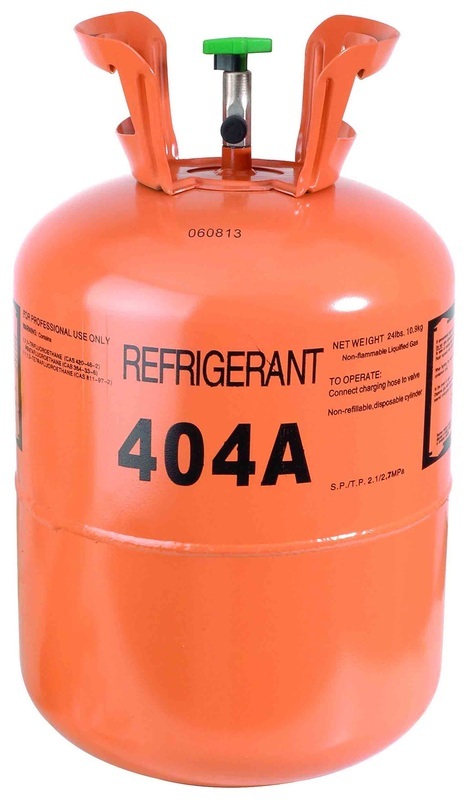 The first commonly used refrigerant was R-717 (ammonia). It is a good refrigerant. It is cheap, has pressures that work for most temperatures and absorbs 500 BTUs per # when is changes from liquid to gas. It is still an effective refrigerant in industrial applications. It could not be used in air conditioning applications because it is toxic so if there was a substantial leak, toxic gas could enter the conditioned space and cause casualties. Likewise, hydrocarbon refrigerants like propane or butane were good refrigerants but could not be used due to their flammability. (Incidentally, butane and propane are now used in Europe to replace CFCs in small units.) Refrigerants like methyl chloride and sulfur dioxide were excellent refrigerants but they are poisonous. For a number of years there was no safe refrigerant for air conditioning. Gasses like carbon dioxide were tried because they were not toxic but they were inefficient, did not mix with oil and the compression ratios were too high. In the 1930s the CFCs were developed. There are several hundred CFCs and HCFCs. Of these, we found 3 to be of the best efficiency and price. They were used for many decades. The first common use for CFCs was movie theaters. They were both nonflammable, nontoxic, efficient and miscible with mineral oil. R-12 was used in autos, household refrigerators, commercial coolers and some air conditioning. It was cheap, highly efficient and operated at low pressures. R-502 was used in mostly low temperature freezers and ice machines. 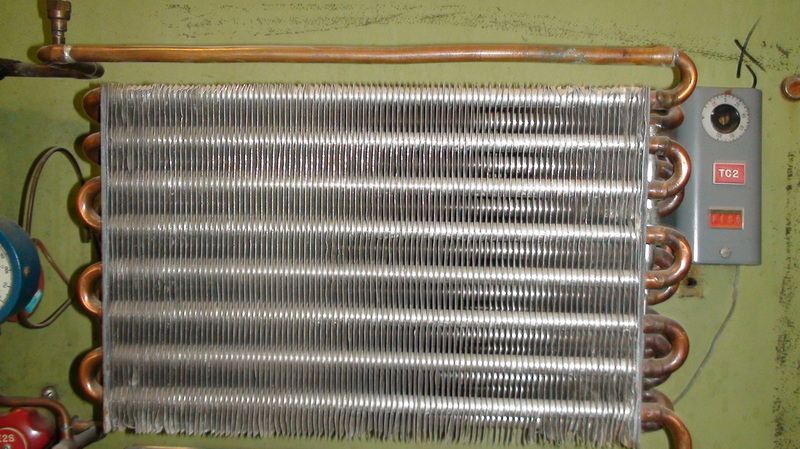 R-22 was used mostly in air conditioners. R-12 and R-502 were also CFCs. That is Chlorofluorocarbon. These chemicals have been determined to be harming the ozone layer in the atmosphere. All CFCs were phased out beginning in 1992. Taxes were added and limits were placed on production accelerating each year. By 1996 they were essentially banned. R-22 was a Hydrochlorofluorocarbon or HCFC. It was not considered as damaging to the ozone as CFCs. Its phaseout was started in 2010. R-134A and R-410 Are HFCs. Thats Hydrofluorocarbon. These refrigerants were developed to replace CFCs and HCFCs when they were phased out. These refrigerants cause no damage to the ozone layer. These refrigerants are considered long term replacements for CFCs and HCFCs. The concept of saturated is a hard one to understand. To be saturated a refrigerant must be in an enclosed container. 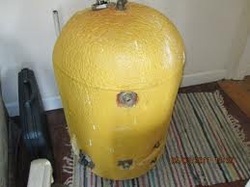 It also must have enough of the refrigerant in the container to be a mixture of liquid and gas. So lets start putting gas into a container by pressurizing the gas. As I increase the pressure, at some point part of the gas will condense into a liquid. As it does this, it releases heat. (Remember latent heat? The latent heat was absorbed when the gas first became a gas from a liquid). Well when the gas becomes a liquid again it releases the latent heat. If the container was insulated to the point that it could not release the heat it would not condense. Pressure would continue to rise until the container exploded. Now, at what pressure the refrigerant will begin condensing depends on the thermal conductivity of the container and the ambient temperature. Look at the coil on the left. It is made of copper with aluminum fins. Because both copper and aluminum transfer heat readily, this container would have high thermal conductivity. Even if it just a length of pipe it is still a container. If my refrigerant were inside this container, it would begin condensing at a fairly low pressure if the ambient temperature was low. This cylinder appears to be well insulated. If I were pressuring up this container, the heat could not escape easily, and the pressure would have to be very high for the refrigerant to condense and release its heat. Ok back to our container. Lets say the ambient temperature is 70 degreesF. I start pumping R-22 into a cylinder. Once the pressure is raised above 121# (check the chart below in the R-22 column at 70 degrees), the gas will begin to condense. As I add more R-22 to the cylinder, more will condense however, the temperature of the cylinder will increase if the heat is not taken away. If all latent heat is removed as the refrigerant condenses, I will continue to condense more gas into a liquid at the same temperature. If I stop pumping more gas into the cylinder, the mix of liquid and gas will stabilize at a saturation temperature pressure. Note when I say temperature pressure when referring to combinations of liquid and gas, the two terms are related and must go together. If I were to place the cylinder in cold water, the temperature will reduce. The pressure would also reduce. More of the gas in the cylinder would condense into liquid and the pressure would reduce. If I place the cylinder in hot water, the temperature would increase and some of the liquid would evaporate and the pressure would increase. So you might say if I warm any gas the pressure increases. That is true. However, the increase is much higher with saturated mixes and there is no temperature pressure relationship. Look at the chart below again. Again note the temperature pressure is 70 degrees and 121#. Look at the same chart for 40 degrees. The pressure is 68.5. With saturated mixes, if you know the pressure, you know the temperature and vice versa. The following video is a demonstration of the pressure temperature relationship. We use refrigerant pressure temperature charts to determine what temperature a refrigerant will boil or condense at what pressure. As an example look at the chart on the left. We will be using R-22. On the left, find 40 degrees F. Move across to where the line crosses with the R-22 column. The pressure should be 68.5 PSIG. So why is the temperature pressure relationship important to HVAC service? When we service air conditioners or refrigeration we need to know the temperatures of certain parts of the system that are hard to measure. With saturated charts we can tell condensing and evaporating temperatures from the manifold gauge set. Also for charging purposes we may need these temperatures and pressures. 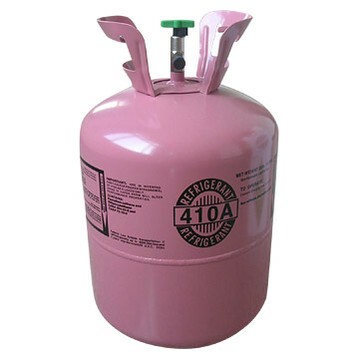 The first common replacement refrigerant for R-12 was R134A. It is primarily used in automotive and some medium temperature refrigerated boxes. It cannot be used as a drop in refrigerant. Drop in means used in place of the other refrigerant without changing the oil or replacing other parts, such as the expansion device. It the case of R-134A, it does not mix with the mineral oil used in R-12 systems and will make sludge. (see refrigerant oils) This will result in compressor failure, usually in about a year. Most other refrigerants used to replace R-12 are blends of 2 or more refrigerants. Some of these are drop in replacements. However, most of these contain R-22 or other HCFCs and are now being phased out. As R-12 has not been used in new equipment since 1992, most equipment that came with R-12 is old enough that extensive repairs should be compared to the cost of new, there will be less need for drop in replacements in the future. R-437A is an HFC that can be used as a replacement without changing oil or other parts. It is primarily used for medium and low temperature applications. It may not be used in auto air conditioning. R-417A and R-422B are interim replacements for R-22. They are also blends. R-410A is a long term replacement for R-22. It is not a drop in replacement. It is only available in new equipment. It is a blend. There are 3 types of refrigerants. Pure fluid: These refrigerants are made of a single chemical. They have a single boiling point. Azeotrope: These refrigerants are made of 2 chemicals that are mixed at the factory. The 2 chemicals may have different boiling points but the factory mixing makes them have a single boiling point. Near Azeotrope: These refrigerants are composed of 2 or more refrigerants. The different refrigerants retain their separate boiling points. Zeotrope: These refrigerants are also composed of 2 or more refrigerants with different boiling points. The difference is the boiling points of the different refrigerants is quite different. will no longer perform as designed.